Pieter Estersohn/Architectural Digest The New York home blends what the architect calls "simple, honest materials" in accordance with the local vernacular. Decorator Thom Filicia has designed lake houses before, but the Manhattan talent had never worked on an Adirondack great camp. Those palatial yet rustic compounds, which had their heyday a century ago, were private havens in upstate New York where the families and friends of Gilded Age tycoons could swim, canoe, hike, fish, play tennis, and share three hearty meals a day without ever leaving the property. 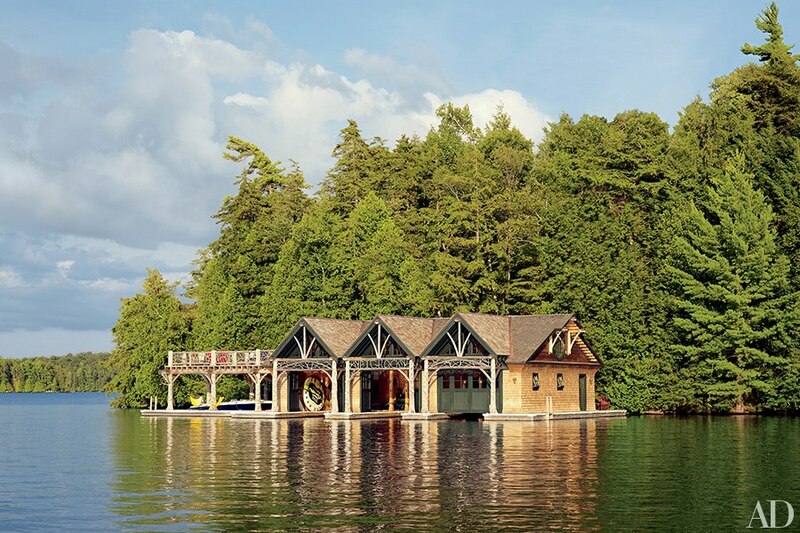 "It's an all-embracing, old-fashioned way of vacationing," says Filicia, who collaborated with architect Arthur Hanlon of the Connecticut firm Shope Reno Wharton on a new great camp on Upper Saranac Lake in the six-million-acre Adirondack Park. The clients, a California couple with two children, envisioned the place as a summer escape that would be the antithesis of their go-go West Coast lives. "They wanted to be in their own bubble," the designer explains of the getaway, known as Big Rock. Located on a peninsula that once hosted the Wawbeek resort, a modest lodge with several cabins, the compound incorporates established view corridors because New York State's Adirondack Park Agency discourages shoreline tree removal. The master-suite wing, therefore, is angled off the porte cochere of the graceful shingle-and-stone main house, making it appear to be a separate cottage; opposite it, on the other side of a curving drive, stands a three-car garage/guesthouse. "Each building has its own distinct orientation and vistas," Hanlon says, noting that the two-story main house's generously windowed protrusions (they contain stairwells) were inspired by the park's fire-lookout towers. Chairs and stools from Noho Modern flank a cocktail table by Mecox on the master wing’s sleeping porch; Thom Filicia designed the slate-color throw for Eastern Accents and the carpet for Safavieh. The kitchen cabinetry, designed by Thom Filicia and Shope Reno Wharton, is painted in aFarrow & Ball white; the hood is by Wolf, the backsplash tile is by Urban Archaeology, the sink fittings are by Waterworks, and the barstools are by Marsia Holzer Studio. The wing chair, from Lillian August, and the Thom Filicia Home Collection sofa are upholstered in Perennials fabrics, and the rug is by Stark. In the daughter’s room, a Cavern wallpaper adds a woodsy note; the vintage beds are painted in a Benjamin Moore green, the sconces are by the Urban Electric Co., and the carpet is a Matthew Williamson design for the Rug Company. The boathouse of a family’s upstate New York getaway, called Big Rock, is accented with traditional Adirondack twigwork. The compound’s buildings were designed by Shope Reno Wharton, and Thom Filicia decorated the interiors. After the site plan was created, Filicia began working with Hanlon on the interiors. The home blends what the architect calls "simple, honest materials" in accordance with the local vernacular: cedar shingles for the exteriors, fieldstone for the fireplaces, and birch logs for the balusters. Says Filicia, "The clients wanted the look to be authentic but with a twist, and I wanted to make sure the architecture popped." So he painted some walls and ceilings blue, green, or dark brown. "The oak beams seem to float against these colorful backdrops," the decorator says. Since Filicia has lived in two lakeside residences over the years, he understood how to furnish the vaulted multipurpose great room for maximum enjoyment. "It needed to be layered, but not haphazard or random," he says. At one end is the living area, with a Knole sofa and button-tufted velvet daybeds. In the center is a games area, where low-slung furniture allows for unobstructed views of the lake. The other end of the room is for dining and features a twig-clad sideboard commissioned from Barney Bellinger, an acclaimed regional furnituremaker. "It was important to have a connection with local craftsmanship," says Filicia, adding that many classic great camps possessed an eclectic, well-traveled air, hence Big Rock's judicious sprinkling of Indonesian side chairs and Moroccan and Turkish carpets. Tour the palatial Adirondack Mountain lake house retreat.